If you ask me, all the great men (and women) in history rose to eminence without ever clicking on a notes application. Alexander the Great, Galileo, Isaac Newton, Steve Jobs, Mahatma Gandhi and countless other ‘illustrious’ figures never clicked on a notes app. Gibbon and Nabokov wrote their classic, timeless works without a notes app (Nabokov famously used index cards to write his peerless novels). In what can only be described as the hallmark of greatness, these giants seemed to instinctively know what’s important in their lives and what’s not. Which task to focus on first, which ones to get to later. and the ones to ignore. But for the lesser mortals of our era, life without icons for a bunch of notes apps on our PC desktop is inconceivable. Truth be said, it seems like all life would come to a screeching halt without notes apps. So there are notes applications galore for Windows, Mac and even Linux. EverNote may be getting all the hype in the notes universe but there are several unsung heroes for Linux too. TomBoy is an extremely simple, lightweight note app to use. Tomboy looks bare bone but will probably do the job for most people who don’t need the bells and whistles. Creating a new note is as simple as clicking Ctrl + N. Supports formatting with bold, underline, font size increase/decrease, italics etc. Comes with sync, export to HTML and search features. Should you want more features, Tomboy has a bunch of Add-ins (plugins) that you can download to expand its capabilities. I found Tomboy on my Linux Mint 17 PC. I’m not sure if it came with Linux Mint or I installed it later. Check in the Applications of your Linux Mint system and if you don’t find it, you can install Tomboy via the Synaptic Package manager or Software Manager. The version of Tomboy on my system is 1.15.4 (as of October 2014). If you’re using some other Linux distro, you can download TomBoy on the Gnome site. Besides Linux, Tomboy is also available for Mac and Windows. Get all the information about Tomboy notes app on the Gnome page. By the way, there’s a C++ port of Tomboy called Gnote. If you’re running Ubuntu, get Gnote from the Ubuntu Software Center. In LinuxMint,the application is available on Software Manager and Synaptic Package Manager. MyNotex is what I use for my notes. This app is more sophisticated than Tomboy/Gnote and includes formatting options like bold, italics and color options for the text. You can insert files and pictures into your notes. There’s a search feature that lets you search by title, keyword or date. This application allows for the use of tags and export and import of files. To get started on MyNotex, you create a subject and then create notes under it. The notes are saved in a sqlite database. If you’re using LinuxMint or Ubuntu, MyNotex is not available via the Synaptic Package manager on Linux Mint or in the Ubuntu Software Center. You’ll have to download it from the MyNotex site. The current stable version of MyNotex is 1.3.0.1. KeepNote is a cross-platform note app that’s easy to use. You create a notebook and then pages under it. KeepNote supports inline images, attachments, rich-text formatting, web links and note-to-note links, full-text search, spell checking and auto-saving. Backup and restore are simple and accessed via the dropdown menu in File. Notes are organized in a hierarchical structure. 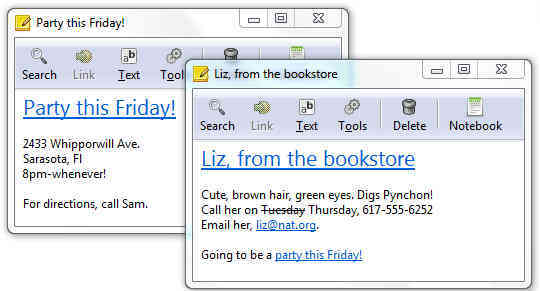 There are free extensions to KeepNote that include export to HTML, tar backup and date insertion. On Linux Mint, you can find KeepNote in Software Manager or Synaptic Manager. If you’re running Ubuntu, KeepNote is available via the Ubuntu Software Center. 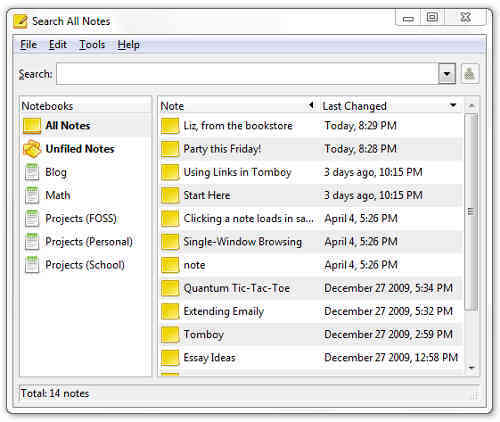 The latest version of KeepNote is 0.7.8. KeepNote is available for Linux, Mac and Windows. Although KeepNote does not appear to have been updated after March 2012, don’t let that dissuade you from trying this robust application. I’m having a hard time figuring out the RedNotebook notes application. At first glance, this application does not seem as user-friendly as the other notes app. It’s more like a diary application. RedNotebook features a calendar navigation, customizable templates, export functionality and word clouds. The app takes about 3MB of space. For details on RedNotebook, go to its SourceForge location. Ubuntu users can install RedNotebook via the Ubuntu Software Center. Those running Linux Mint can install it through Software Manager and Synaptic Package Manager in Linux Mint. The current stable version of RedNotebook is 1.8.1. The version in Linux Mint’s Software Manager and Synaptic Package Manager is an older version: 1.4.0-1. Besides Linux, RedNotebook is available for Windows and Mac as well. I’m waiting to see if all these notes applications make our generation more productive and help you, me and the countless others to put out more great works of art, science and literature than our note-less forbears.